Spring weather always beckons my children into our backyard but lately we've been experiencing some chilly temperatures and "rain delays!" The girls have been eyeing all of the beautiful bulbs and flowers for sale at the garden center and begging to buy some for our own yard. I was hoping we could find a way to bring some spring indoors. When Blue Print social sent us some some Mod Podge Washout and Apple Barrel paint in cute spring colors to play with, I knew this little playroom windowsill garden would be the perfect cure for our springtime wanna-be gardening blues! We picked up some terra cotta pots and dishes at our local garden store and the girls painted them with the Apple Barrel paint. 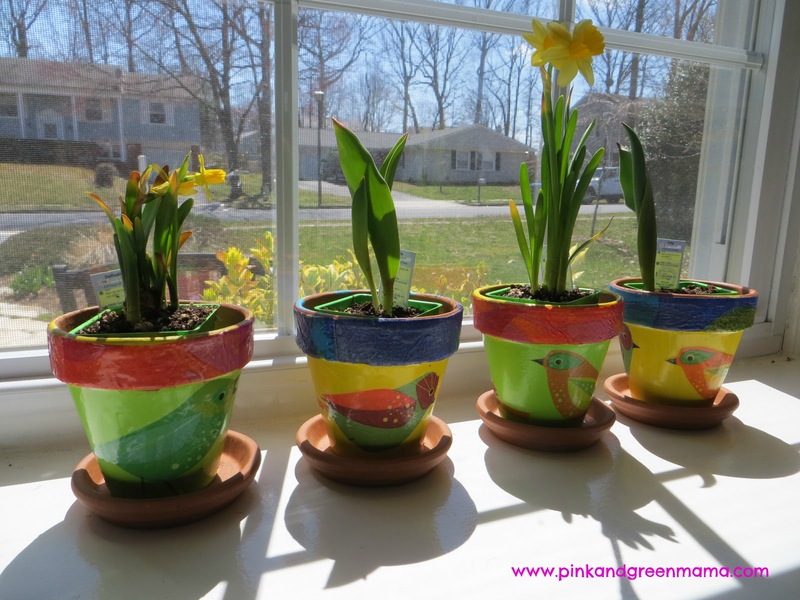 The girls picked yellow (Banana) and green (Lime Tree) paint for their pots. We love their all-purpose acrylic craft paint for our family projects because it cleans up with soap and water (while wet) and Apple Barrel paint comes in so many pretty colors! 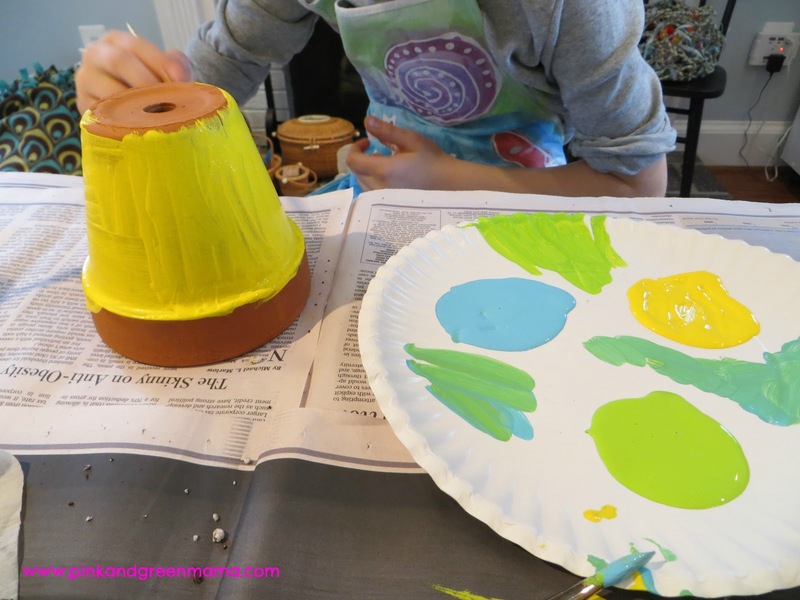 The coverage on this paint is great, it only took two coats to cover the terra cotta pots nicely and it dried quickly - a plus when you're working with kids who are impatient and want to move on to the next step! 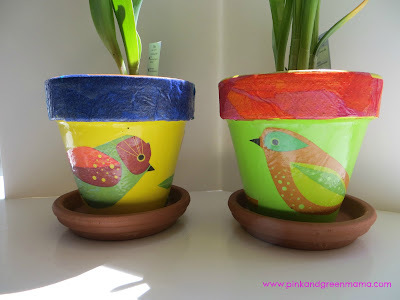 After the paint dried on the flower pots, we cut the bird and flower shapes out of some decorative paper napkins I picked up at Ikea and applied them to the flower pots with Mod Podge Washout. It's the same great formula as "regular" Mod Podge Gloss but it washes out of clothing and furniture with soap and water, even when it's dry. This will be my new "go-to" Mod Podge for kid's projects. It is great for moms and teachers! We also Mod Podged the top edge of the flower pot with some botanical leaf print paper napkins we found in a drawer. Blue napkins on the yellow pots and orange/hot pink napkins on the green pots. HELPFUL HINT: Whenever you Mod Podge decorative paper napkins to a craft surface, make sure you separate all of the layers of tissue - the image is printed on the top layer and there are usually at least three or four layers on the napkin to pull apart. 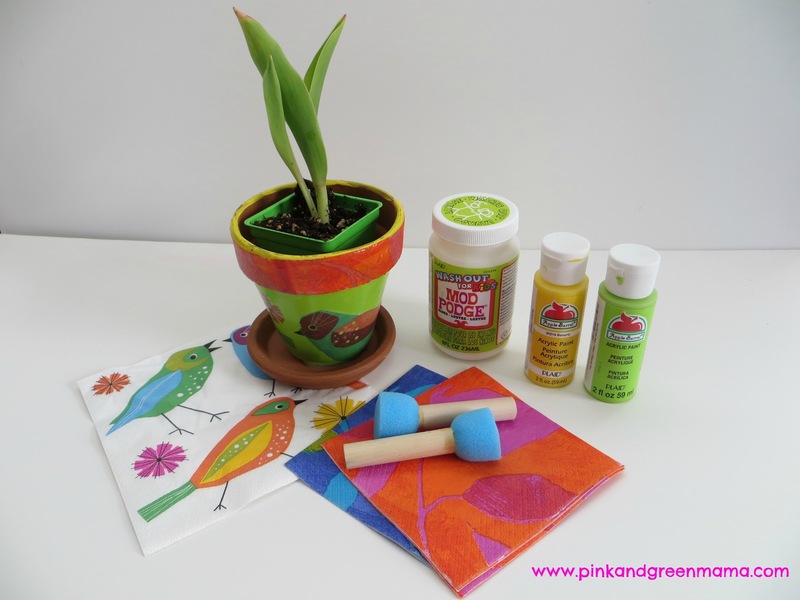 Paint the area with Mod Podge, press on the napkin and gently dab another layer of Mod Podge on top to seal it. The girls really love their new playroom windowsill garden. 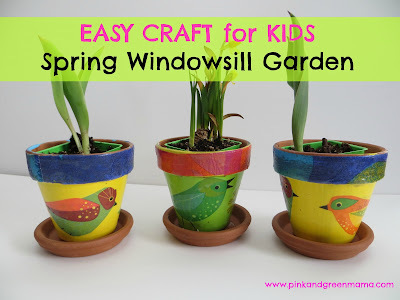 When the bulbs are done flowering, we're going to plant them in the yard and try growing some other green kitchen garden goodies like an "avocado" pit tree, lemon seeds, and scallions. We're bringing science, art, and nature to our playroom! 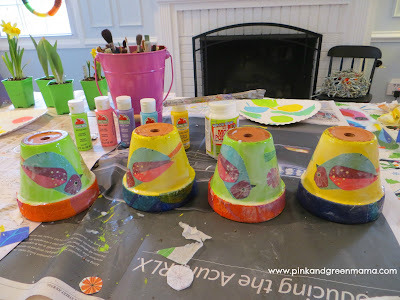 A special thank you to my friends at Plaid Enterprises for sharing such fun art supplies with us, we have another project coming up with Apple Barrel Paint and Mod Podge Washout that I can't wait to share with you! but I really DO like Mod Podge Washout and Apple Barrel Paints! The Artful Parent Book Review and Blog Tour.